Blue Jasmine. From the BF Department of Forgotten Woody Movies. Resurrected from our 2013 archives. By Paul Goldfinger, Blogfinger movie critic. This is our one film retrospective of Blogfinger reviews–back up to 2013. Occasionally we try to time travel, re-posting some of our most widely acclaimed articles. Let me begin by saying that I would see any movie made by Woody Allen. But that doesn’t mean that I think that everything he has done is wonderful. However, I have never seen a Woody movie that didn’t have something to really like. The ingredients that I am usually drawn to in his films include the cinematography, the music, the characters/ casting, the design/sets, and the brilliant screenplays. 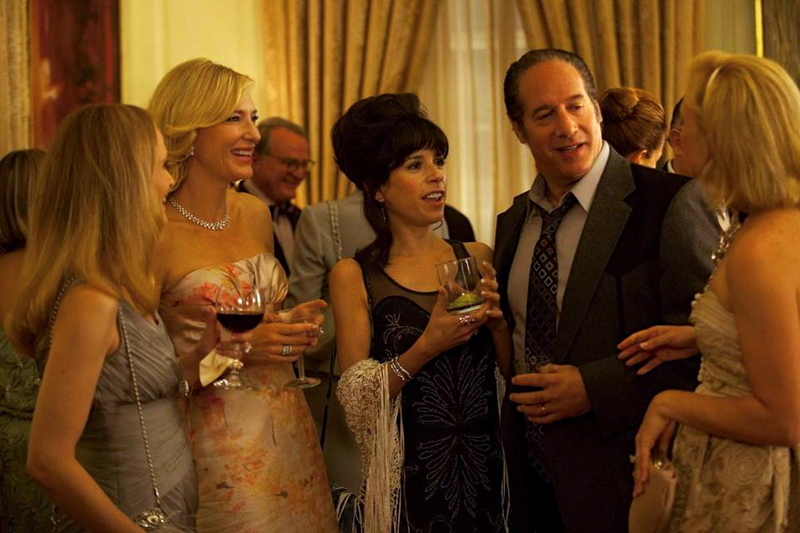 Blue Jasmine is a superior film, but it is not like most of his movies. It has some flaws including elements that don’t seem to fit together very well and some repetitiousness in the story. However, there is much to admire here, especially the acting and the characters, so see it again. Cate Blanchett, the Aussie actress who won an Oscar as a Queen Elizabeth I, is so good that it’s impossible not to be fascinated by her performance throughout the entire film. Her role as Jasmine is enough reason to see Blue Jasmine. Chili, the muscular guy who is dating Ginger, is a Stanley Kowalski type, played brilliantly, wearing sleeveless undershirts, by Bobby Cannavale, who was wonderful in his role as a psychopathic gangster in HBO’s Boardwalk Empire. Cate plays Jasmine French, an elegant, sophisticated New Yorker who is married to a rich but shady financier—a Madoff type of guy. She has every material wish granted and she spends her time going to matinees, organizing charity events, making entrances at grand parties and travelling first class. But that world shatters, and she spends the rest of the film unraveling. She loses everything after her adulterous husband Hal (Alex Baldwin) goes to jail and she travels to San Francisco to live with her sister Ginger, who is a cashier in a super market. Andrew Dice Clay, the foul mouthed comedian of yore, is excellent as the blue collar ex-husband of Ginger. None of the characters is without some personal flaws, but Jasmine is in front of that line and is the central focus of the film. Once again, the superb Santo Loquasto is the production designer; and the apartments and other settings, coupled with the color palatte of the film, and the lighting are the ingredients which always make Woody’s films feasts for the eyes—whether they are set in Paris, Manhattan or a low-down neighborhood in San Francisco.